Amazing music, a line up that always surprises, fashion models in rubber boots – Glastonbury is one of the world’s most famous music festivals. It also has a reputation for being more than slightly soggy, with the mud as memorable as many of the musicians. Your mission: to have a great time! Your challenge: to stay comfortable whatever the weather! Prioritise which bands you want to see. Be realistic, allow for plenty of time and don’t cram too much in. 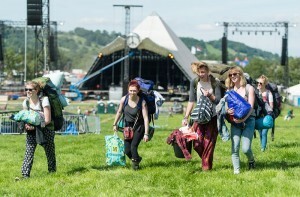 Glastonbury’s a huge site and can take a while to cross, especially when it rains and the pathways get muddy. It’s important you drink plenty of water, especially if its actually good weather. Staying hydrated will give you greater endurance and keep your temperature in balance. Pack a sturdy bottle that can be refilled for free at one of the water kiosks. Don’t wear the wellies you’ve borrowed that you can barely squeeze your feet into, or the cracked and perished pair your Dad gave you. Wellies need to be watertight and comfortable to wear. If it’s sunny, a pair of hiking boots will be a useful piece of kit. Pack both. So you can strip down, or build up, controlling your temperature and comfort. Choose material that is lightweight so it will dry out easily after a torrential downpour. Jeans are not a good idea – when wet, they’re soggy, cold and difficult to dry. Remember it gets cold at night, so pack a warm lightweight layer too, fine wool or a fleece. Keep all you need for the day in a rucksack or bag that will carry your water bottle, sun cream, torch, waterproof clothing, mobile phone, money. And keep an eye on it at all times. Don’t expect to rely on the same outfit for the whole weekend. It isn’t just your feet that can suffer from the mud! Keep some spare clothes in your tent and make sure you have waterproof contained for them, such as a bin liner. Don’t keep all of your money in one place, hide a reserve in a safe place. Bury your wallet in your bag and keep it zipped. Glastonbury isn’t all peace and friendship, sadly. Unless you’re planning to dance every minute, a folding camp chair or stool will take the strain off you back and give you a chance to rest. Avoid three days of sitting on the ground or the constant hunt for a bench. Sleeping well will keep you fighting fit! Pitch your tent on higher ground if possible, with your entrance facing away from the prevailing wind (from the south west). For comfort, avoid sleeping on the slopes, but if you’ve got no choice, make sure your feet and the door to your tent are pointing downwards.